My husband wishes I would learn to stay quiet…at least until I get tenure at my high school teaching job. See, I have a tendency to rock the boat about issues that I am passionate about (remember the pie-eating-contest-fiasco from a few years ago?). 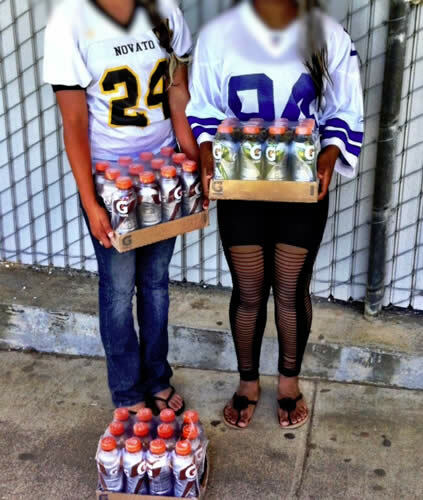 This time around, I had a hard time keeping my trap shut when I heard that Gatorade reps would be on our high school campus handing out free samples to our students during G-week. When I tried to find out how this came to pass, I got the run-around, with several people shunting the responsibility to others. 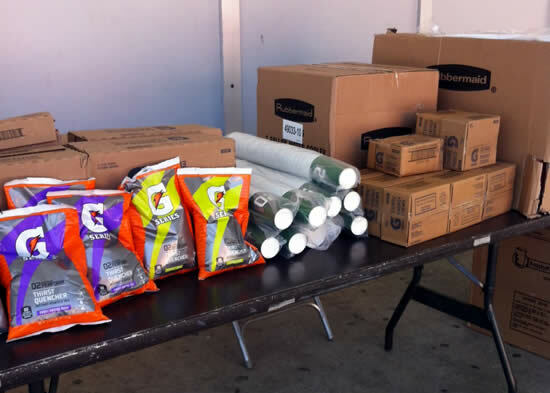 One coach finally admitted that Gatorade called to offer free “nutrition classes” for our athletes. I was suspicious. Gatorade offering nutrition classes? I would no sooner take a class on healthy eating from McDonald’s. But I had some students do some investigating so that we could learn what these classes would entail. When a student called Gatorade on my behalf, they said that they do not offer any such classes, and that “it might be something special that your sales rep came up with on his own.” Clever guy. It’s hard to imagine that his sales wouldn’t increase after he shares his products on a campus teeming with over 1,000 thirsty students. Needless to say, no nutrition workshop or teaching was offered…unless you call advertising “teaching.” Students were, however, encouraged to drink the pre-game formula, the during-the-game-formula AND the replenisher after the game is over. Woah – 3x the buying power. And I thought ONE product is all we needed. I’ll say it again – clever guy. When one student asked me “what I have against Gatorade,” I told him that we have a California state education code that is intended to protect students and to ensure that they are not offered “non-nutritious” items at school. The majority of the samples being served exceeded the legal limits on sugar, sodium and/or potassium. Never one to shy away from a teachable moment, we talked about artificial colors and sweeteners and the benefits of eating food that grows on plants, and not foods made in plants (thanks, Michael Pollan!). There is now a joke in class about my enthusiasm for coconut water, a natural source of electrolytes, as opposed to the colorful chemical concoctions that were being handed out on campus. When I asked a colleague who runs marathons about her favorite sports drink, she agreed that coconut water was ideal because it was “real” and helped her to recover quickly after a long workout. Their presence on campus also raises ethical issues about where to draw the line between business and education. I understand that the athletic department needs funding for equipment, transportation, coaches etc. However, they should not be selling out or trying to get sponsorships from companies that don’t comply with the law. Students and athletes require exemplary nutrition – and chemically formulated compounds hardly qualify. Every 4 grams of sugar in your beverages = 1 teaspoon. We are an educational institution first and foremost. If we allow sugary beverages to be handed out on campus, it looks like we endorse the consumption of beverages that contain up to 10 spoonfuls of sugar. But heck – elite athletes claim that sports drinks have hydration benefits, so it must be true, right? 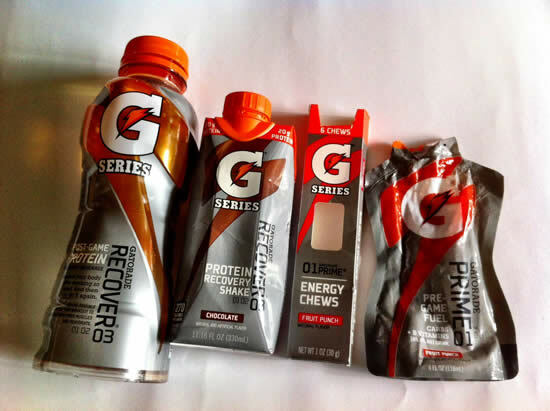 Gatorade has its own institute to conduct and publish research and to educate sports health professionals and athletes on sports nutrition and exercise science. “Perhaps one of Gatorade Sports Science Institute’s greatest successes was to undermine the idea that the body has a perfectly good homeostatic mechanism for detecting and responding to dehydration—thirst.” It’s no wonder that an analysis by Yale University’s Rudd Center for Food Policy and Obesity found that over a quarter of American parents believe that sports drinks are healthy for children. Too bad they aren’t taking my biology class! People have been so brainwashed by marketing campaigns about what they “need“ that they may ignore what their bodies REQUIRE from a nutritional standpoint. Younger children have more body surface area than adults, and so they can become more easily dehydrated during an equivalent workout. Need a rule of thumb? Try this: Salt replenishment may be necessary for younger children after a 60 minute-long strenuous workout, and for adults after 90 minutes. Don’t be fooled into thinking you need to drink your sodium! Nancy Clark, a registered dietitian who specializes in sports nutrition suggests that athletes eat a handful of whole grain salted pretzels or crackers, eat some orange slices, and drink plenty of water to stay hydrated and replace salts and water lost through sweat. When I told my friend Susannah, a nutritionist and school-lunch-reform colleague, about G-week, she rolled her eyes. Like me, she promotes nutrition from real food. She says, “athletes are the ONLY ones who MAY benefit from drinking sports drinks, and even then, it’s not the best way to hydrate and replenish electrolytes.” She also turned me on to this interesting article, The Truth about Sports Drinks, which I highly recommend. Thankfully, this story has a happy ending: I invited Miguel Villareal, our food service director, to campus to take a gander at G-week. He met with our principal, and after discussing the state education code and what is best for our students, they agreed that Gatorade would not be welcomed back on campus. Aww shucks 🙂 It certainly makes my job nicer when I have students who are eager to learn. It does blow my mind to see how counterintuitive drinks like this are – especially for people who appear to be “fit minded”. Bravo, Michelle! I wish more people would speak up like you do. Great job! I was pretty nervous – but thank goodness, my school district praised me for raising the issue instead of reprimanding me for making them look bad 🙂 I think they see it as progress, which was a huge relief. Congrats. Thank you for standing up for our kids. Most kids (including my own) will not always make the best choices left to their own. When I noticed soda machines in our Jr High, I was so upset that I questioned the reasoning behind that poor decision.I watched kids throw away apples and drop $ in for 16 oz of poison. Those machines were unplugged and moved to the teachers lounge- not much better, but a consolation. It reminds me of (a funny movie) “Idiocracy” where the future inhabitants on earth became so stupid, they believed that even plants needed electrolytes! oh the power of advertising. What a great article! I am continuously fighting the Gatorade battle in my son’s baseball dugout. Why do people look at me like I am a complete moron for not knowing that our little athletes “NEED” Gatorade or they may wither away and die?!? The sports drink companies have done their jobs well! It is unfortunate that the dollar often reigns over common sense. Michelle, I applaud your success in this venture. I am a mother too. When I think of my teenager’s mind being degraded by the actions of educational advocates (whom he has been taught by me to admire the opinions of), it makes my blood boil. Thank you for being willing to speak on behalf of our children to protect them from the mediocre minds of who don’t think of the ramifications of their actions.